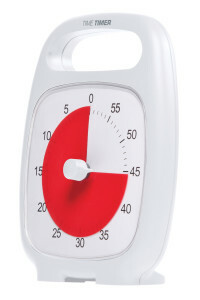 The Time Timer® PLUS also available in white! The Time Timer PLUS protects the signature red disk under a clear and durable lens. Simple new controls ensure ease of use for all ages. New features represent nearly 20 years of growth and innovation. 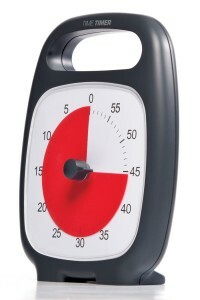 A nice product with many options to use for every person who benefits from time management. Fast becoming our most popular timer, the Time Timer PLUS packs all the features that have made our timers the first choice of teachers, students, parents and professionals into a new design that’s as sturdy as it is useful. The Time Timer PLUS works on 1 AA alkaline battery. The battery is NOT included. To open the battery compartment you need a small size (nr.0) philips head screwdriver. 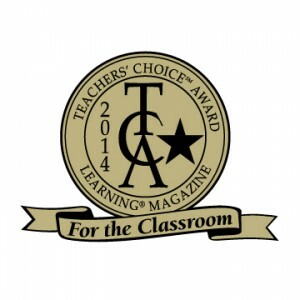 The Time Timer PLUS has won several awards: Teacher’s Choice Award – Classroom 2014, Teachers’ Pick Award 2014 and Teachers’Choice Award – Family 2015! A great result which makes us very proud. These Awards are rewarded to products that have proven to be a valuable asset to the class room or at home.